What do you think about children in daycare homes with pets? I'm curious about pets and children in a daycare. Is it alright? Just wondering as we have a couple of very well behaved cats and wondered if I could still open a daycare. Answer: Thanks so much for your question, it is an important subject for many child care providers. I know many providers who have pets. 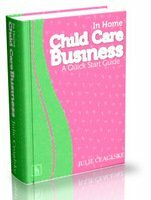 This should not stop you from providing child care but here are some things to consider; It is important to tell your prospective clients during the interview or even on the phone when they call. They may not have concerns about the most common issues with pets, they may have a concern about allergies to pet dander. Be sure to check your home owners liability insurance to see if it will cover you for this. While you're at it ask them how many children you can watch and still be covered under your home owners. This is a mistake many child care providers make, they assume their insurance covers them AND the business in the home. If you need help with this I can share a very good source for Child Care insurance. Years ago we had a dog and I actually had a parent tell me during the interview that was the only reason they did not want their child in my care. This was after I told them the dog never has contact with the children. So expect a few to pass on your service. Hope this gives you an idea of what to consider. Comments for What do you think about children in daycare homes with pets? I have 3 cats and a daycare with 4 kids in it. I have had parents ask if they were de-clawed and comment on allergies just as Julie said. I haven't had any issues or anyone decline using me yet. Best of luck Ali with your cats and your new business!